Use this handout to create a fun and interesting lesson. Students translate popular text messaging abbreviations into English words. Now have the students practice their generated language into proper English expressions, sentences and conversations. Use this exercise to have students practice speaking about abilities, giving personal information and when talking about occupations. Works well for pair work or in small groups. Powerpoint about part-time jobs to follow. My Part-Time Job! 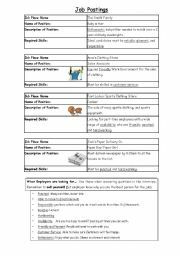 (2 of 3) Use this exercise to have students practice speaking about abilities, giving personal information and when talking about occupations.�@Works well for pair work or in small groups.�@Powerpoint about part-time jobs to follow. Text Speak! Use this PowerPoint presentation to create a fun and interesting lesson. Students translate popular text messaging abbreviations into English words. Now have the students practice their generated language into proper English expressions, sentences and conversations. My Part-time Job! 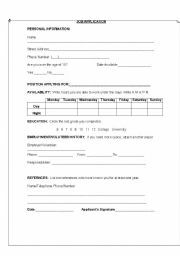 (3 of 3) Use this exercise to have students practice speaking about abilities, giving personal information and when talking about occupations. Works well for pair work or in small groups.